Our Alberta Street neighbors have heard them cheering, east-siders have seen them exploring their streets, and Portlanders everywhere talk about them: the Community Cycling Centers’ Bike Campers. They are kids at day camp; the city is their campus, and their bikes are their tools for adventure. Every summer, kids flock to our shop with their bikes, imaginations, and goals to expand their geographic and personal horizons. Bike Camp teaches safety, group riding technique, right of way, and basic, hands-on maintenance skills. Yet the biggest lesson is the empowerment kids receive from a summer adventure on two wheels. Families have been asking for it, and we’re delivering: an additional location for our Bike Camps! We’re piloting 6 sessions to start and end their day from Sellwood Cycle Repair, a bike shop located in SE Portland. Our southeast and southwest families will have a shorter commute, and campers can explore a different part of the city. We haven’t forsaken our Alberta Street headquarters. 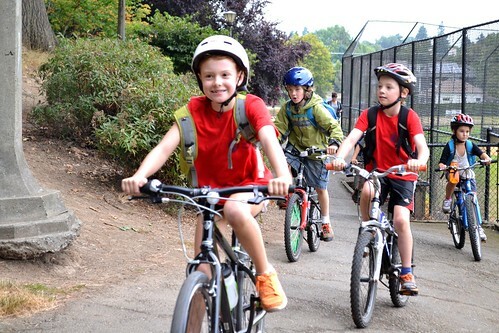 The majority of our camps will still launch from our bike shop, where campers enjoy the traditions of Bike Camp in beautiful, historical northeast Portland. 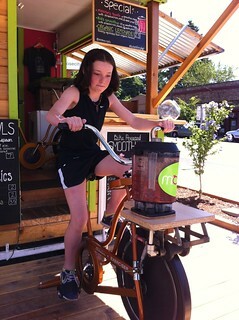 We’ve always been innovators at the Community Cycling Center. This year is no exception. While our campers will have their choice of the traditional Coasters, Cruisers, and Freewheelers camps, we’ve also added new themes. Our Cruisers-age campers (kids entering fourth and fifth grade) will have the option of a Bike Craft Camp, where in addition to daily rides, campers will make a daily craft from recycled bike parts. For those campers who participate in a Spanish Immersion program in school, or speak español at home, we will offer a Spanish Immersion Bike Camp taught by our bilingual instructors. Our Mechanics Camp, piloted last year with our high school campers, will now be offered to the middle school age group (grades 6-8). You can also expect to see Food Cart Freewheelers return again in 2014 with more sessions! Despite the updates and innovations, Bike Camp is, at its heart, a fun and empowering experience for kids on their bikes. We keep our traditions alive, such as weekly bike-delivered fruit popsicles, all-camp games, and the amazing challenge of the camper milestone of riding up Mt. Doom. Want to know more about Mt. Doom? Sign up for Bike Camp 2014! We just posted the 2014 Bike Camp Schedule! Registration begins Monday, February 3rd, online at www.CommunityCyclingCenter.org.